Every now and again a book comes out that makes you sit back and think, ‘Why didn’t someone write this before?’ about a subject that everyone talks about even when they don’t have much of a clue. These discussions rapidly get into deep water because no-one ever wants to admit that they only have the most tenuous grasp of the facts, and salmon fishermen are as prone to getting into them as anyone else. The outcomes vary from the inconclusive to the catastrophic and yet they are doomed to continue while anglers are forced to rely on the press for their facts. Anyone who has ever tried to follow the progress of the negotiations regarding the North-East drift net fishery will know exactly what I mean, as the papers, while showing a commendable interest in the subject, sent out junior reporters who didn’t fish and almost without exception failed to understand what was at stake. Well here is a book which explains what went on and the science and the politics that lay behind it - and not only about the North-East drift nets, but about every fishery that impacts on the Atlantic salmon, and the many other threats to this unique fish. Derek Mills is a very well respected fisheries biologist who is better known for editing scientific proceedings focussing on the species, but he is also a keen angler and this work is an extraordinarily well-balanced and mature attempt to summarise all the forces acting for and against the salmon. Every issue, from catch and release, through fish farming, to pollution is dealt with in its turn and Derek has included a useful summary of all the organisations involved which will help readers to deploy that killer argument in the pub. 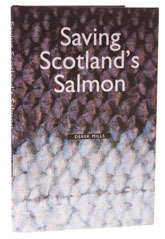 Written by anyone else, Saving Scotland’s Salmon would be as dull as ditchwater, but Derek’s tremendous enthusiasm for his subject shines out and if this book doesn’t get some kind of prize, then the people who award prizes should be ashamed of themselves. If you are a salmon fisherman, then you definitely need to read this.